(SEE VIDEOS & PRICES) Used Pre-owned Steinway Pianos For Sale Model M-B- L -O-S for NYC, NY, CT, NJ, MD, Westchester, PA, Houston TX Texas, Dallas TX Texas, Glendale AZ, Little Rock AR, Boulder CO, Norwalk CT, Dover DE, Naples FL, Savannah GA, Boise ID, Chicago IL, Indianapolis IN, Des Moines IA, Wichita KS, Louisville KY, Honolulu HI, New Orleans LA, Portland MA, Ann Arbor MI, Gulf port MS, St. Louis MO, Omaha NE, Reno NV, Manchester NH, Newark NJ, Jacksonville NC, Fargo ND, Cleveland OH, Portland OR, Philadelphia PA, Providence RI, Columbia SC, Sioux Falls SD, Nashville TN, Midland TX, Salt Lake City UT, Charlottesville VA, Charleston WV, Madison WI, Florida, Annapolis VA, Baltimore Virginia and the rest of the USA. Another in our new “Designer Pianos” Series. Absolutely remarkable, sublime sounding, Steinway Model O 5’10.5″ Hand Painted shabby chic, white sandstone. In keeping with the latest trends in home decor, we have created this multi-layered work of art on this very special sounding Steinway O made in 1918 during the “Golden Age” of Steinway manufacturing. Partial rebuild about 15 years ago, new strings, new pins, new dampers, new Renner Blue hammers and shanks. Renner hammers are used by the the Hamburg Steinway factory, Bosendorfer, Bechstein and many other high end piano makers. Rich sounding, very round tone and responsive action this Steinway is both a beautiful work of art and a sublime-sounding instrument. Great candidate for a PianoDisc IQ Player System. Warranty. Worldwide shipping. 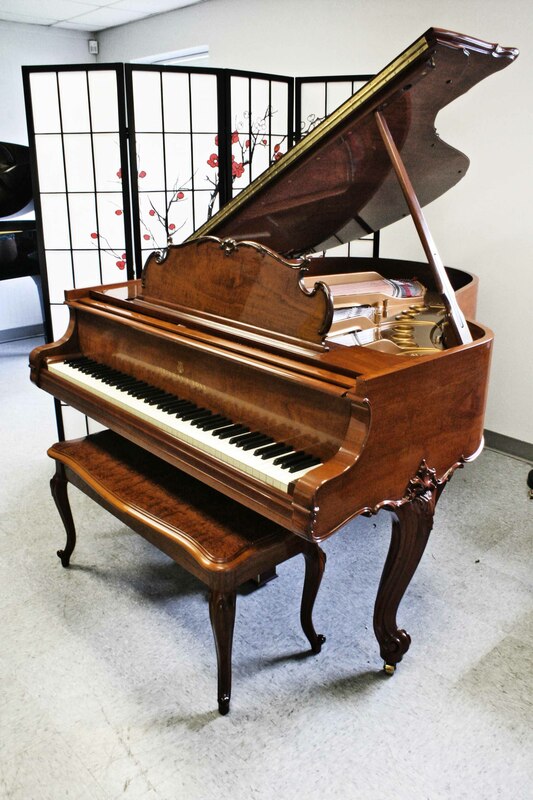 Sonny’s Art Case Pianos: Steinway D 8’6″ Art Case “Victorian” Style Totally Rebuilt/Refinished $25,000. Sonny’s Pianos is a Used Steinway Piano Dealership shipping worldwide. We Are Used Steinway Specialists! Worldwide Shipping! See Wholesale Prices and Videos On Our Website. We Offer A Warranty On All Of Our Pianos. VISIT OUR WEBSITE TO SEE ALL OF OUR PIANOS THAT WERE JUST REDUCED IN PRICE FOR OUR CLEARANCE SALE! 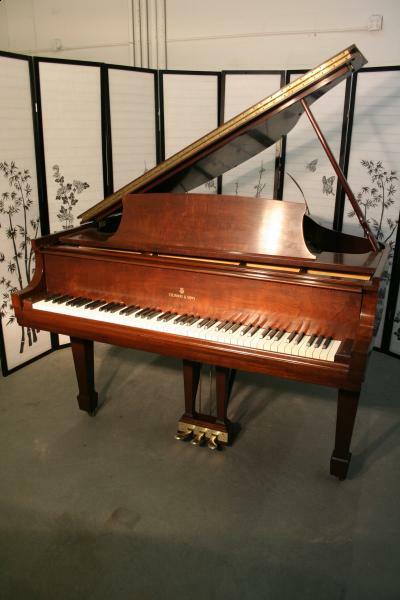 DON’T MISS OUT ON AN OPPORTUNITY OF OWNING A STEINWAY PIANO AT SUCH A LOW PRICE! TO SEE OUR ONLINE SHOWROOM WITH PICTURES AND VIDEO TOURS OF ALL OUR PIANOS! Steinway Baby Grand Piano Model S 5’1″, 1960, pretty mahogany, all excellent condition original Steinway parts. Our technicians regulated the action, shaped the hammers, cleaned the strings and soundboard, adjusted, aligned and voiced the hammers. Our furniture people went over the finish, buffing out any scratches then gave the piano a french Polish (applied several coats of hand rubbed padding lacquer then went over it with very fine steel wool to give piano an even sheen and a like new look). Warranty. Free Long Island NYC delivery. All else continentaly USA only $475. To view Sonny’s PianoTV VIDEO tour click here! Magnificent Steinway Grand Piano Model O, 5’11” made in 1908, totally rebuilt in 2007. New soundboard, pin block, strings, dampers, Steinway wippens/hammers/shanks. Beautifully refinished mahogany. The tone and action repsonse on this piano is simply remarkable. T o have this piano rebuilt like this by Steinway or elsewhere would cost well over $30K. Warranty. Questions? Call Sonny Direct at 631 475-8046. Steinway Grand Piano Model M 2001 From “Crown Jewel” Collection (VIDEO) Exotic “Bubinga” Wood w/ PianoDisc CD Player System $28,500. Steinway Grand Piano Model M 2001 From “Crown Jewel” Collection Exotic “Bubinga” Wood w/ PianoDisc CD Player System $28,500. Steinway Grand Piano Model M 2001 From "Crown Jewel" Collection Exotic "Bubinga" Wood w/ PianoDisc CD Player System $28,500. Art Case Steinway Piano B King Louis XVI Style $32,000.Reblt/Refin. Click here to view Steinway Piano Model M Chippendale Video Tour! Has to be one of the most gorgeous pianos currently for sale in the world. Just rebuilt and refinished by high end world re-knowned NYC rebuilders, Steinway Model M 5’7″ King Louie Style Grand Piano. Originally manufactured in 1948. New board, pin block, finish, Steinway hammers and shanks, pins, string, dampers, bridges. Sublime tone and action response. Just regulated to world calss level. Beautiful original ivories. Eveyrthing about this piano is just magnificent. Very few like this still around. This one will last for another 100 years. Questions? Call sonny Direct 631 475-8046. Visit Our Online Showroom. See Photos, Video Tours, And Much More!